Atlanta Hawks signed 21-year old Australian international center Isaac Humphries (216-98, college: Kentucky) to a 10-day deal. It is actually Humphries' comeback to the Hawks as he has played here before. He just played at Erie Bay Hawks. In 46 NBA G League games he had 11.1ppg, 6.8rpg and 1.0apg this season. Humphries also spent pre-season at the Hawks earlier that year. Despite young age he had impressive career. Humphries' college team won SEC Tournament for two years in a row (2016 and 2017). Humphries has been also a member of Australian international program for some years. He played for Australian senior team this year and previously for U19 National Team in 2014. Humphries represented Australia at the World Championships U17 in Dubai (UAE) five years ago. His stats at that event were 7 games: Score-3 (18.9ppg), Reb-4 (11.6rpg), 1.6apg, Blocks-3 (3.3bpg), FGP: 57.6%, FT: 82.9%. 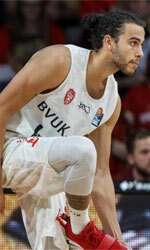 Humphries has played previously professionally in Serbia (FMP Beograd) and Australia (Kings). He attended University of Kentucky until 2017 and it is his second season as a professional player.